The Carter Lake Crossing is a point to point crossing of Carter Lake in Colorado. Situated at just below 5800 feet, this nearly 3 mile swim is located in one of the most picturesque lakes in Colorado. Awards will be given out to the top three finishers in each division for each race. Divisions will be both non-wetsuit and wetsuit for both men and women for each race. Hope to see you there! Race day registration - Cash or Personal Check only. Must bring valid I.D. for check in. Time cut-offs: You must capable of completing the distance and be able to complete the three miles within two and a half hours (2.5 hours)! 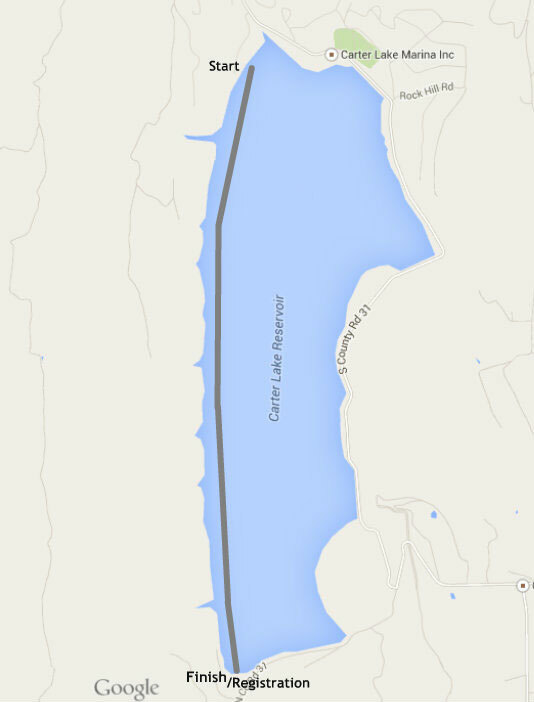 The Carter Lake Crossing will be a deep water start. Race Packet Pickup will begin at 5:00am at the South Shore Campground. Complimentary Shuttle buses will be provided for all participants and volunteers to get to the start line. We encourage arriving early to get a seat and not be left behind. This service will begin at 5.15am. From Boulder: Take 287 N. Left on 56E/W Co Rd 8. Continue Right on Co Rd 23. Left on Co Rd 8e. Head into park and up the hill. After first switchback, continue straight on N Co Rd 31 to South Shore Beach Campground. From Denver: 25N to Exit 243 (66W/Co Rd 30). Right on 287 N. Right on Co Rd 23. Left on Co Rd 8e. Head into park and up the hill. After first switchback, continue straight on N Co Rd 31 to South Shore Beach Campground. From Fort Collins: Take 287 S. Right on 56E/W Co Rd 8. Continue Right on Co Rd 23. Left on Co Rd 8e. Head into park and up the hill. After first switchback, continue straight on N Co Rd 31 to South Shore Beach Campground. Please bring a copy of your receipt – you will not have to pay an entrance fee at the front gate with proof of entry in the race! Carpooling is encouraged!!! Arrive early. Parking is limited at Carter Lake. Registration is at South Shore Beach Campground and the race start is at North Pines Boat Ramp. Shuttle buses will be provided – information will be sent in a later email. Spectators are encouraged to wait at the South Shore Beach Campground for best viewing and more accessible parking.